This story is only found in Luke. Jesus and his disciples were walking along when ten lepers called out to Jesus (“Jesus, Master, have pity on us!”). A variety of skin diseases were lumped under the umbrella of leprosy at that time. Lepers were considered to be highly contagious and were not allowed to be near others. They lived in the countryside and often gathered in small groups for companionship, comfort and support. With no other means of earning an income, they would stand, at a suitable distance, from well travelled roads, calling out to passersby for charity. This particular group of ten had obviously heard of Jesus and had either chanced upon him and recognized him as the much talked about healer, or had heard that he was traveling this road and had set out to meet him. Jesus saw them and responded to their plea. Jesus treats the lepers as if they were already healed, and instructed them to go show themselves to the priest. In order for them to be accepted back into society as a non-leper, a priest had to examine them and declare them ‘clean.’ Without questioning, the ten turn and obediently head off to see the priest and as they went healing occurred. ​It would be easy to see this story as black and white, grateful and ungrateful, but that would be unfair. The lepers were told to go to the priest by Jesus and that is exactly what the other nine did. 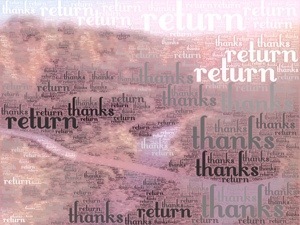 I am sure that they were grateful and that they were filled with thanksgiving that they had been blessed with healing. The difference was that the one intentionally turned to thank Jesus. Jesus, the one sent by God. to bring healing both physical and spiritual to all people. One of the learnings that we can take away from this story, is that we too need to be intentional about thanking God for our blessings. In turning to God to offer thanks for the many blessings God gives us, we begin to see God working in our lives. We begin to understand that we are God made, not self made. Most important, we begin to trust that God is active in our lives and loves us both in our times of joy and in our times of challenge. Thanksgiving Day, the day set aside particularly to give thanks to God, is a perfect day to begin that turning back, to offer thanks. Previous Post MESSY CHURCH: ‘Church Light’, I Think Not!